Our schedule of upcoming tours is listed below. Additional tours for spring, summer, & fall 2019 will be posted soon! Also, see our info about customized private tours and birding lessons. At the heart of spring migration, this weekend of birding is set at Blueberry Hill Inn, a quaint and secluded inn surrounded by the beautiful Green Mountain National Forest. We’ll enjoy the migrant songbirds flooding into the area – scores of colorful warblers, tanagers, grosbeaks, orioles, vireos, and more. We’ll also watch nesting herons, breeding loons, and an array of raptors and owls. We’ll likely find over 100 species in total during the weekend, including more than 20 warbler species. Some likely highlights include Northern Goshawk, and Cape May, Bay-breasted, Golden-winged, and Canada Warblers. 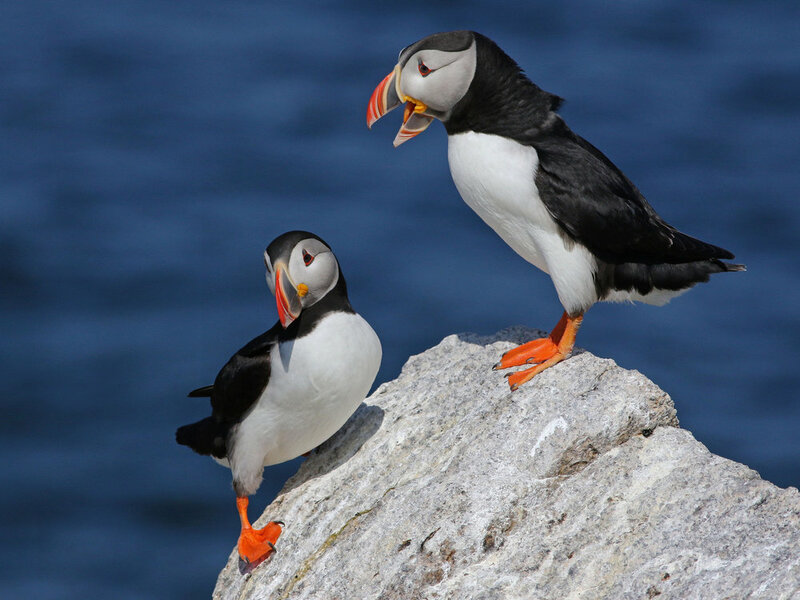 From Bicknell’s Thrush to the Atlantic Puffin, this tour makes a thorough exploration of northern New England’s rich bird diversity and beautiful landscapes. Starting on the shores of Vermont’s Lake Champlain, this tour travels through Vermont’s Green Mountains, the boreal forests and White Mountains of northern New Hampshire and Maine, and to the coast of Maine and one of its famous offshore seabird colonies. The tour highlights the many specialty bird species of New England including the localized breeder Bicknell’s Thrush, boreal residents such as Spruce Grouse and Black-backed Woodpecker, an abundance of breeding warblers including Mourning, Cape May and Bay-breasted, and breeding seabirds such as Atlantic Puffin, other Alcids, and Terns. Based in the north woods of New Hampshire, this tour takes a strong focus on finding boreal specialists. 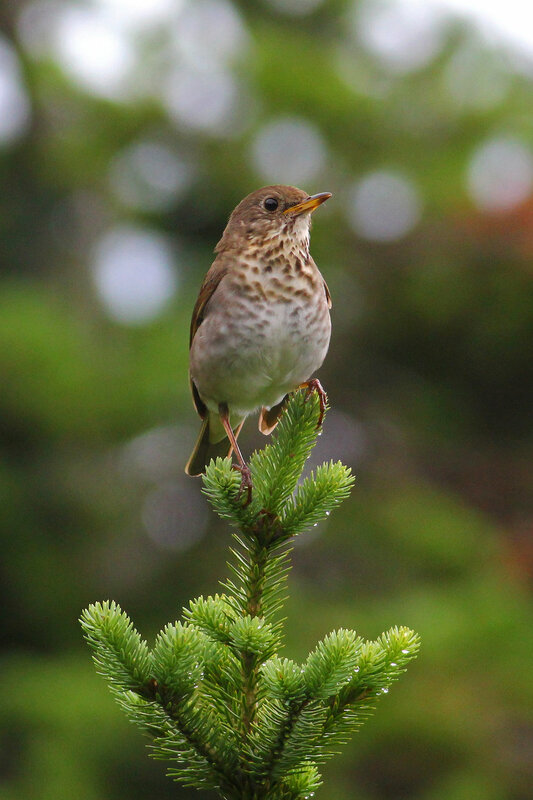 We kick off the tour with a mountaintop visit for viewing the elusive Bicknell’s Thrush. For the rest of the weekend, we’ll explore pristine boreal forest, bogs, and lakes, tracking down a high diversity of species in the North Country. Focal species include Spruce Grouse, Black-backed Woodpecker, Boreal Chickadee, Canada Jay, Northern Saw-whet Owl, Yellow-bellied and Olive-sided Flycatchers, Philadelphia Vireo, Rusty Blackbird, Lincoln’s Sparrow, “Red” Fox Sparrow, and an array of breeding warblers – Mourning, Cape May, Bay-breasted, Tennessee, Blackpoll, Wilson’s, Canada, and Magnolia, plus many more. Transportation provided from Portland, Maine and back, or meet directly in northern New Hampshire. The Nelson’s Sparrow extension (below) makes a great 1-day add-on. This tour, in the picturesque coastal region of southern Maine, can be done either as an extension to our New Hampshire Boreal Tour or as a stand-alone single day tour. The tour focuses on viewing the secretive and sought-after “Sharp-tailed” Sparrows – both Nelson’s and Saltmarsh Sparrows – as well as many other specialties in the region. We’ll also have a chance to find Little Egret, Tricolored Heron and Little Blue Heron. Other focal species on the day include Roseate and Least Terns, nesting Piping Plovers, Upland Sandpiper, “Eastern” Willet, Glossy Ibis, American Oystercatcher, Willow and Alder Flycatchers, Bank Swallow, Grasshopper, Vesper, and Field Sparrows, Brown Thrasher, Indigo Bunting, Bobolink, Eastern Meadowlark, and Prairie Warbler. Transportation provided from Portland, ME or meet in Scarborough, ME. This weekend tour packs in a lot of birds in a short period of time. Based from the legendary ski resort, Jay Peak, the tour explores a diversity of habitats across northern Vermont from the lush Green Mountain deciduous forest and mountaintop spruce-fir, to boreal forest, grasslands, and Lake Champlain. We’ll take a sunset tram ride to take in the dusk chorus of the mountaintop Bicknell’s Thrush. Other highlights include boreal specialists such as Spruce Grouse, Black-backed Woodpecker, and Boreal Chickadee, grassland birds such as Upland Sandpiper, and Grasshopper and Vesper Sparrows, breeding Black Terns, and an abundance of warblers including Mourning, Canada, Golden-winged and Blue-winged Warblers.